As we look back and mourn the dark losses in communities like The Tree of Life synagogue in Pittsburgh, Pennsylvania, and the fires in Malibu, Paradise, and Thousand Oaks, California, which also saw a deadly shooting of twelve people, we look ahead and anticipate our University City community celebrating Hanukkah and Christmas. Yes, we are University City – more than just a neighborhood. Hanukkah will begin the evening of December 2nd and end the evening of December 10th, while Christmas is on December 25. On December 14, Dinner with Santa and the lighting of the Christmas tree and the menorah will bring us together in unity and respect for each other’s religion. Small towns across America will celebrate also this year. If the Statue of Liberty is an icon of freedom, then Dinner with Santa and the menorah and the Christmas tree lighting are also icons of freedom. 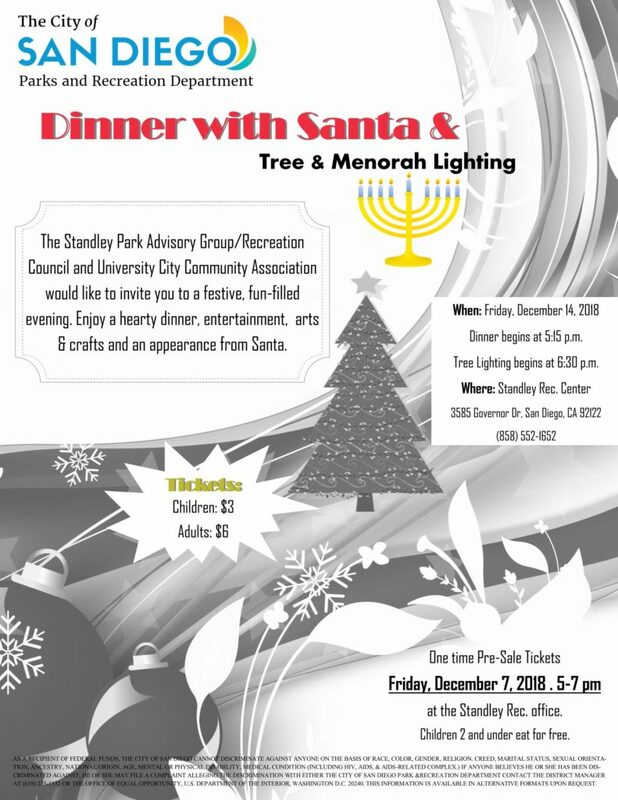 Traditionally, University City Community Association provides the tree and menorah lighting. Holiday music will enhance the evening with Standley Middle School Marching Band and the Tectonics, a barbershop quartet. Coffee Bean will supply hot chocolate to go with Carl’s Junior delicious cookies. Regency Centers is underwriting many of the costs and SANDAG is providing the lighting. Santa Claus will hear the wishes of children and spend time at the Dinner with Santa in the Standley Park Recreation Center. 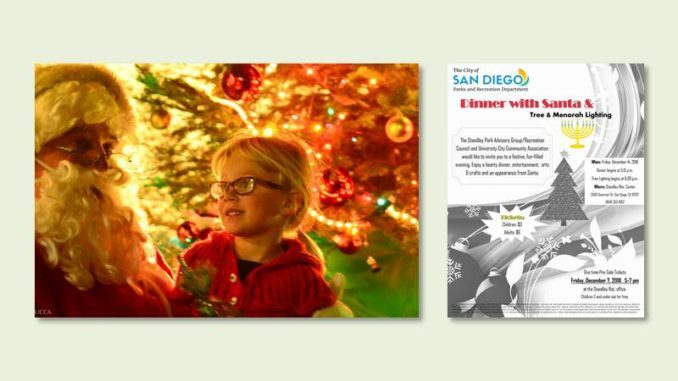 Dinner with Santa begins at 5:15 PM. Tickets are $6 for adults, $3 for children, free for children under age 2. The food provided by Lornas Italian Kitchen. Lighting of the Christmas tree and menorah is at 6:30 PM. The Standley Recreation Center is located at 3585 Governor Drive. If you have questions, please refer to the attached flyer or contact the Recreation Center at 858.552.1652.